I can press out your old, worn small-end bushing and replace it with a new bushing. Critical to a long lasting bushing is proper reaming. Without proper reaming, your bushing may be out of round. 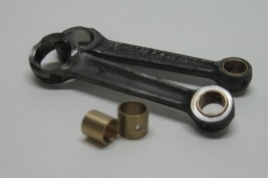 In this instance, although a new wristpin may fit, the bushing is not likely to last long. I have factory tools to do a precise ream the first time, for cheap. *Note - I have New Old Stock (NOS) Puch 12mm bushings. 10mm bushings are aftermarket.